Memorial Day is around the corner and there is really only one thing on my mind: Summer! School will be out soon and those long sunny days will (somehow, hopefully!) be full of play, fun, a bit of travel and memories in the making..... this entails a lot of planning on my (and most mom and/or dads) end, so the last thing we want to worry about are our kids being unnecessarily exposed to toxic chemicals. I just don't want to deal, and I am sure you don't either. Never fear, Non-Toxic Munchkin is here, with our 2016 (Non-Toxic!) Summer Guide: because you already have to spend your time figuring out what you are going to do with the kids while school is out - now you don't have to spend your time figuring out what the safest products for them to use are! Everyone should be wearing sunscreen on a daily basis (and reapplying), especially during summer. With the amount you will be applying all over you and your child's biggest organ (your skin), it makes sense, then, to buy a sunscreen that will protect you and your family from the sun's dangerous rays and not expose you to numerous dangerous chemicals. The good news? Today, there are is a plethora of safe, non-toxic alternatives available. There is no reason NOT to buy a safe non-toxic sunscreen; you just need to know what to look for and which to choose, because the one you have been using since you were a child might not be the safest option. The bad news? In the Environmental Group's 2015 report, researchers from EWG discovered that 80% of the sunscreens on the market offer “inferior sun protection or contain worrisome ingredients like oxybenzone and vitamin A,” naming Neutrogena as the brand most at fault for promising sun protection without delivering. 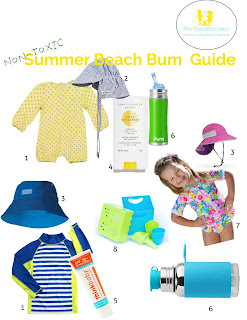 To find out how your sunscreen stacks up, or to find out how to best choose a sunscreen (other than those mentioned below) read our post "
thinkbaby sunscreen SPF 50+ benefiting LIVESTRONG, 3 ounces : I like Thinkbaby because it is available in so many mainstream stores and the price point is not too high! Beautycounter Protect Stick Sunscreen, SPF 30: Safe and easy for fussy kids (like mine) to put on themselves. UV SKINZ UPF50+ Boys Long Sleeve Sun & Swim Shirts-Orange/Navy-5 This company's Founder was a mother of three boys when she lost her 32 year old husband to skin cancer. Commited to " bring products to the market that can help families live sun safe while never forgetting how important it is to LIVE and HAVE FUN outdoors. : she founded UV SKinz. " UV Skinz are sun shirts that are not made with any chemicals or lotions. The UV protection is in the tight weave of the fabric." The offer SPF clothing for the whole family. They have the whole family (adult, kids and babies!) covered offering everything from bodysuits, long sleeve and short sleeve tops and hats. Baseball hats: do well protecting your face and nose, but offer no protection the back of the neck and ears. Make sure you use plenty of sunscreen in these two areas if you opt for this type of hat. Zoë b Organic makes a corn based plastic toy set, that is biodegradable, toxin free, and made in the USA. We have had them at home for about 4 years and they are as good as new. According to their site, "if they get accidentally left on the beach and washed out to sea, they’ll completely biodegrade in 2-3 years (same results in fresh water, compost, or buried in soil)." It feels good to buy something that won't be around in a landfill or, worse, floating in the ocean, hundreds of years from now. 1. Pura Sport 18 oz Stainless Steel Water Bottle with Silicone Sport Flip Cap, Plastic Free, NonToxic Certified, BPA Free : I am obsessed with these and every single family member in my house has one. Why? lightweight stainless steel and absolutely no plastic. none whatsoever. They also come in different sizes with different sipping options (5 oz for infants, 11 ounce, 18 oz and 28 oz: I love the largest size listed here for adults and older kids. For younger kids the smaller size with sippy or bottle top is ideal).